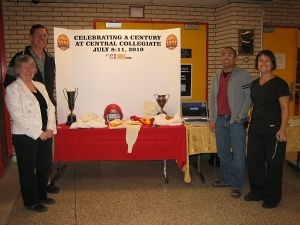 It was quite a hit Launching the CCI100 website at Central's parent teacher interview. It's amazing how many people have stayed in Moose Jaw. We were trying to capture the parents who attended Central (roughly those from grads '67 - '90). Another generation has passed on CCI's traditions and it shows from the parent-teacher interview. Some of the present students were even amazed that their parents were once "cool" teenagers!!! We are doing an official launch over a two day period. Tomorrow, Deb Cowan ('71) and Deign Salido ('87) will be interviewed by CHAB/Country100 with regards to the Centennial Reunion in 2010. Please be sure to listen in.